Love minions? Love cakes? If yes, then this cake will become your absolute favorite. This delicious cake comes with 2 minions placed on top of the cake that add a distinct ‘minion’ flavor, look and feel to it. 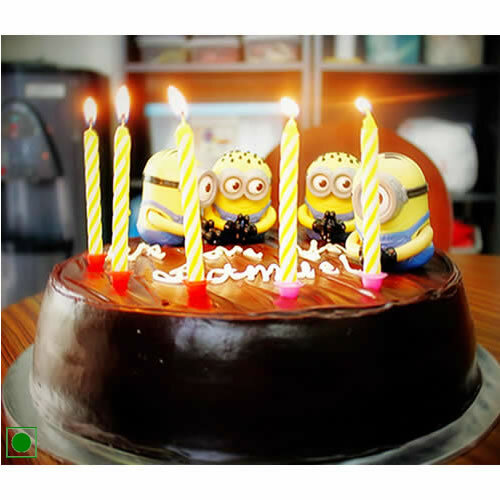 Minions are a favorite character of almost every child and when they’ll see these minions, firmly placed on topof the cake, they will get very excited. The minions will add many more smiles and joy to their celebrations. So, if you are planning to celebrate your kids’ birthday, then this cake will be apt for him or her. Add a fun element to the celebration. Content:1/2 kg chocolate cake. You can also set cake weight as per your wish. 2 minions will be available in half kg. 4 minions will be available in 1 kg. Delivery available for 1/2 kg cake only in Jaipur. For other cities, set weight- 1kg or more. Guarantees may not apply for timingsduring different celebrations and occasions such as Valentine’s Day, Friendship Day and Christmas etc.